Inspired by the Philadelphia project of the same name, Signs of Solidarity was a citywide public art project that took place on January 19, 2017. Over 30 artists, activists, organizers, and building owners came together to create and display large banners with messages of love, hope, and inclusivity to stand in opposition to hate and divisiveness. The banners were displayed simultaneously on various buildings and businesses throughout the city. 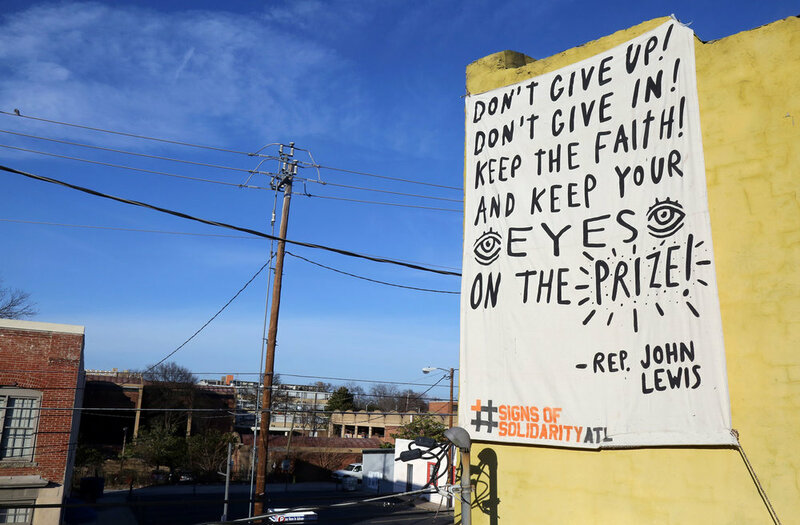 Using the words from a John Lewis quote, this banner was hung on the exterior of Mother Bar + Restaurant on Edgewood Ave. Thanks to Mark and James for trusting me and my banner up on their roof.